I got a tattoo few years ago, when i was young and now I think I really didn't think it through. 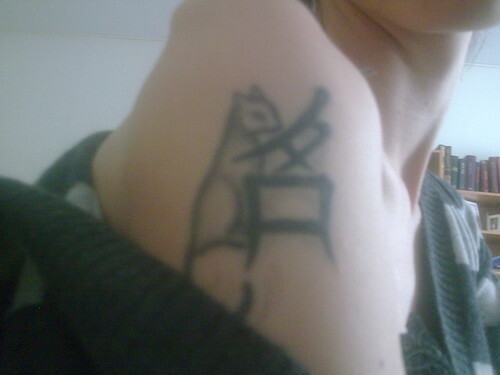 In tattoo there is cat (looks like a rat), so I started to wonder if the mark with the cat is really real. Does it say anything, is it false? When I took it, it had meaning for me. Now I can't even remember that word what it was supposed to meant. I've checked all the possibles I know it could be, but haven't found that mark anywhere. I know, I've might been a stupid and I really don't understand how I forget it. Maybe it was that I didn't really understand what it meant and I just trusted the man who tattooed it. I've read too much stories about people having stupid, even insulting or meaningless tattoos, so I just want to know if mine is real. Thank you very much in advance. I hope you can help me. I put the picture of tattoo for you. It looks like 名 to me, what do you think?